Originally published in The Clarinet 45/2 (March 2018). Printed copies of The Clarinet are available for ICA members. Some 20 years ago, while still a high school student, I first encountered Clarinet Classics at the now defunct Tower Records Classical store on South Street in Philadelphia. I purchased several discs on that trip, one of which included The Early Clarinet Family, CC0004, which included works by Handel, Beethoven, Graupner, and Danzi performed on period instruments by English clarinetist Keith Puddy. At that time, I had acquired the music to Beethoven’s Duo No. 3 in B-flat, Wo027, for clarinet and bassoon and sought a reference recording, which this disc included. 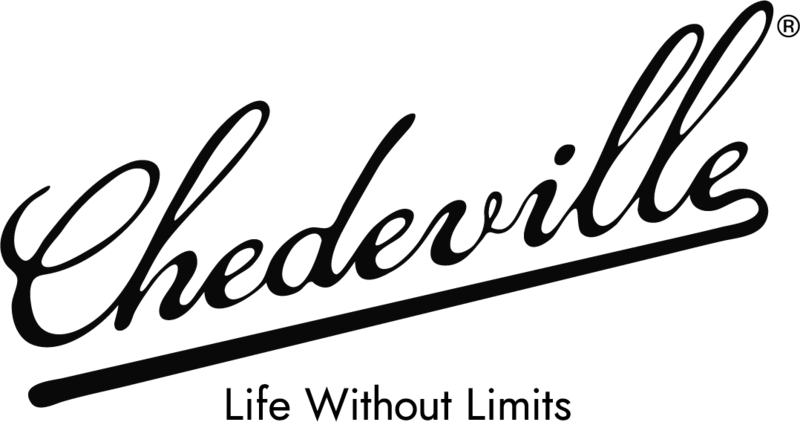 Although this is among the label’s earliest offerings, it represents its significance as a purveyor of unique reference recordings for our instrument. To commemorate its 25th anniversary in 2017, Clarinet and Saxophone Classics rebranded as Samek Music. Its catalogue includes nearly 80 discs and counting by internationally renowned artists such as Philippe Cuper, Janet Hilton and Luigi Magistrelli, to name but a few. It has become one of the most comprehensive sources for reference recordings of obscure literature, historical instruments and influential clarinetists, much of which is not available elsewhere. This label archives expertly restored historical recordings by significant and celebrated clarinetists of the 20th century such as Reginald Kell, Louis Cahuzac, Dame Thea King, Alan Hacker and Aage Oxenvad. Each volume includes detailed liner notes with comprehensive biographical information and program information. A tour of www.samekmusic.com offers not only a storefront, but also comprehensive resources with freely accessible interviews of performers, blog entries, podcasts, pedagogical resources and more. At the helm is acclaimed clarinetist Victoria Soames Samek, artistic and executive director. Beyond this role, she serves as a professor at Trinity College of Music and the Royal Military School of Music, with an active schedule of performances and workshops, and endorsements by D’Addario, Selmer Paris and Lomax Classic Mouthpieces. Recent recording projects by Samek include three composer-centric albums of clarinet chamber music by hallmark composers Joseph Horovitz, Paul Harris and Richard Rodney Bennett. 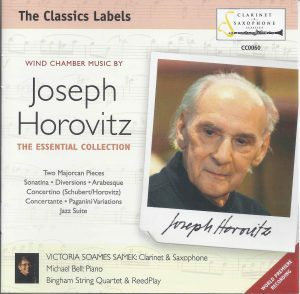 Wind Chamber Music by Joseph Horovitz: The Essential Collection, CC0060, presents this composer’s complete clarinet catalogue and one saxophone work, each recorded in his presence. Pianist Michael Bell, the Bingham String Quartet and ReedPlay join Samek for the array of represented mediums. Beyond his Sonatina for clarinet and piano, a repertoire staple, this recording includes a number of less familiar works, some of which are transcriptions presented for the first time. Although the Sonatina has been recorded numerous times since its premiere in 1981, the composer’s thoughts about tempo have changed from those published in the score. Samek and Bell’s convincing rendition reflects these subtleties and provides new insight into Horovitz’s intentions. Other works for clarinet and piano include Arabesque, originally for flute and piano; Two Marjorcan Pieces, original works inspired by indigenous music; and Diversions on a Familiar Theme, written for a visit to the Royal College of Music by Queen Elizabeth II. According to the liner notes, Horovitz used Schumann’s The Merry Peasant for the “familiar theme,” which was the result of a phone call advising that it was Her Majesty’s favorite piano-practice piece in her youth. Chamber works complete the program. Two such works are for clarinet and string quartet, which feature Samek and the Bingham String Quartet. These include Horovitz’s first published work, Concertante for Clarinet and Strings, Op. 1, and his adaptation of Schubert’s Sonatina in D for violin and piano, D. 384, for clarinet and string quartet. The latter was a student effort to realize how Schubert might have approached a clarinet quintet. The ensemble’s performance is eloquently shaped and sensitively balanced. This is a successful transcription worthy of programming! ReedPlay, an ensemble comprised of Samek and colleagues equally adept at both single-reeds, provides a charming and light-hearted conclusion to this volume with Variations on a Theme of Paganini for saxophone quartet and Jazz Suite for clarinet quartet. 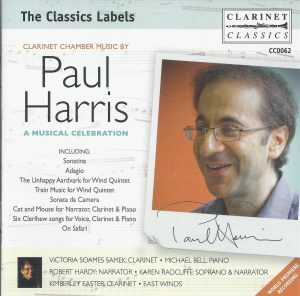 Clarinet Chamber Music by Paul Harris: A Musical Celebration, CC0062, also includes works for a variety of instrumentations, one of which is particularly rare: Divertimento for Piano and Wind Quartet, scored for flute, oboe, clarinet, bassoon and piano. 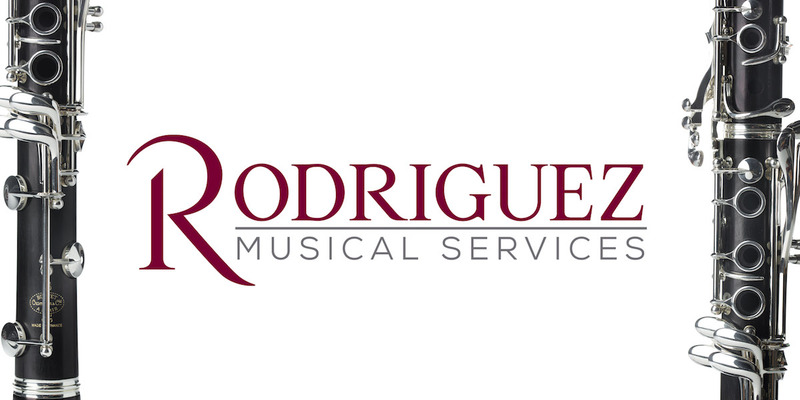 Works for clarinet and piano, each appropriate for collegiate and professional recital programs, include his Sonatina; Visions; Adagio; King’s Parade; Swiftly; Suite in 5; Introduction, Theme and Variations and Fantastical Micro-Variations on a Theme by Mozart. The latter uses the first four measures of the Mozart Clarinet Concerto theme. It is two and a half minutes of humorous variations and could be a perfect closing selection or encore – clarinetists may find it difficult to contain their laughter at Harris’ treatment of this phrase! Of particular note are those works ideal for young audiences: Train Music for Wind Quintet; The Unhappy Aardvark for Wind Quintet; On Safari for Two Clarinets; and Cat and Mouse for Narrator, Clarinet and Piano. Each is clearly programmatic, palatable and engaging for such listeners. Harris’s Trio for Flute, Oboe and Clarinet, Sonata da Camera for solo clarinet, and Six Clerihew Songs for Voice, Clarinet and Piano round out the disc with textural variety. Samek again collaborates with Bell on the piano, but clarinetist Kimberly Easter, East Winds, narrator Robert Hardy and soprano Karen Radcliffe also join her. Each performer, either individually or collectively, effectively captures Harris’ entertaining compositional style. 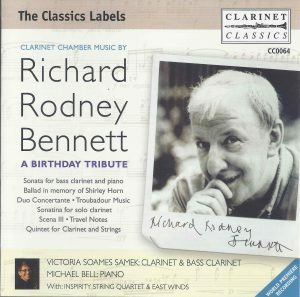 Samek’s most recent composer-centric disc is Clarinet Chamber Music by Richard Rodney Bennett: A Birthday Tribute, CC0064. Samek again collaborates with pianist Michael Bell and the East Winds, as well as Inspirity String Quartet. This disc includes Sir Bennett’s Duo Concertante and Troubadour Music for clarinet and piano, Sonatina and Scena III, both for solo clarinet, Clarinet Quintet (with string quartet), and Travel Notes for wind quartet. Although each composition is a wonderful part of our repertoire, I found two works on this volume particularly worthy of mention. The first is Sonata for bass clarinet and piano (1999), which is Richard Ralph’s 2011 transcription of the bassoon sonata, with the composer’s permission. The concluding work of this disc may be Bennett’s most convincing contribution to our repertoire: Ballad in Memory of Shirley Horn (2005). As its title suggests, this work is vocal in nature and reflective, although there are significant challenges of range and technique throughout. Samek and Bell’s collaboration for this performance is especially expressive and heartfelt. These three composer-centric recordings feature an array of remarkable performances and compositions worthy of your attention. I hope this entices you to listen and visit www.samekmusic.com!